In Rajasthan, numerous nomads wander the Thar desert or camp on the outskirts of its large towns. Amongst them there are the Gaduliya Lohars (blacksmiths), the Banjaras (originally in charge of the salt business) and the Kalbeliya Saperas, who charm snakes and treat their bites. Gulabi Sapera belongs to this last community. 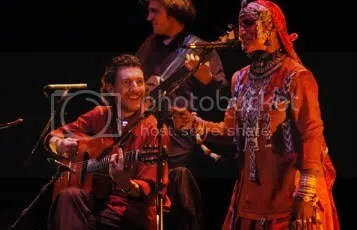 Thierry ‘Titi’ Robin is an exceptional guitarist, Oud and Bouzouki player. His musical achievements are characterised by a coherence of style, derived from his deep interest in Gypsy culture, which for him is an inexhaustible source of inspiration and the basis for colourful artistic coalition with Gypsy artists from all over the world. 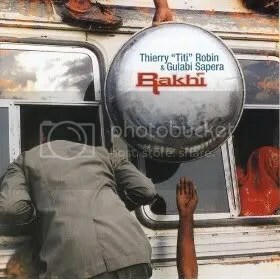 Their album Rakhi is dedicated to the union of their respective worlds using songs from the world of the Kalbeliyas. The opening track, Holi Yaad, introduces the listener to the unique atmosphere of the album. Gulabi’s singing is calm and nostalgic, the delicate sound of Robin’s guitar immerse the listener into a pleasant swing. Gulabi’s voice often converses with male voices (Saway Nath and Banwari Sapera), making the music more complete. Surprisingly, the most raunchy track Bichu Rap draws the greatest attention. It is a kind of a dialogue between a woman and a man, overflowing with emotions in a theatrical way, leaving no one indifferent to what is being sung. Gulabi Sapera and Titi stopped working together since 2007. रूह तक उतरती हुई संगीत ….